This is the kind of unhampered exposure the lovely female back deserves. The plunge is deep, flattering - for Catalina follows the natural curves of the back to emphasize the core of it's beauty. The result not only bares you beautifully, but also acts as a perfect backdrop for a glorious suntan. Only a Catalina can enhance your special charms so completely. The headline to the pictoral says "Enhance your special beauty with a Catalina." I find it interesting and refreshing that they chose to shoot the models from the back side. Which is your favorite? 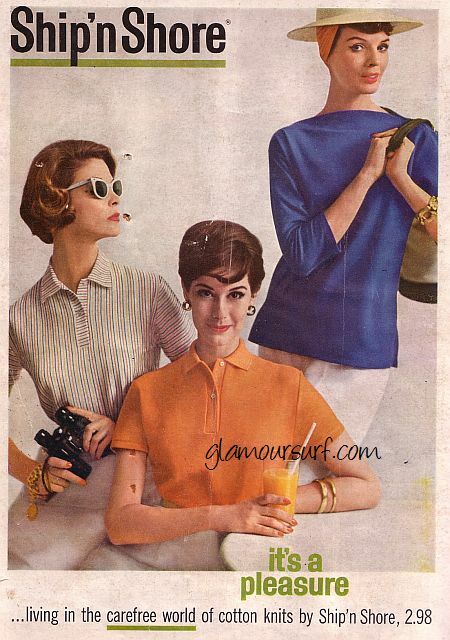 I received a fabulous magazine from 1959 on my birthday this week and I've been busy busy scanning images from it. This one from Ship 'n Shore on the back cover is fabulous. Isn't the model a true ringer for Joan Holloway of Mad Men? 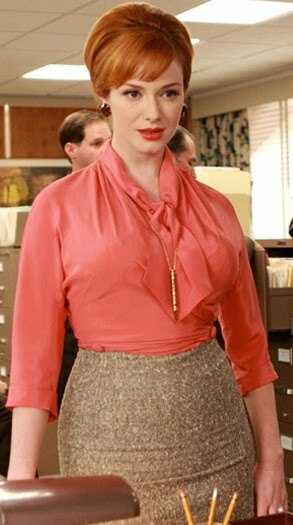 Joan is played by the talented Christina Hendricks and has come back to Mad Men's season 4. I'm so glad she's back! I'll be sharing more from this issue all week, stay tuned. 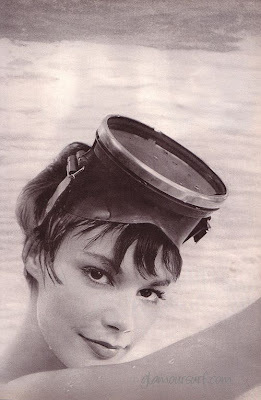 Busy busy day today at GlamourSplash so I'll just leave you looking at this underwater beauty from 1959 and wishing you a blessed day! While watching the season premier of Mad Men last night I was excited to see a couple of scenes with the newly formed agency, Sterling Cooper Draper Pryce, in a pitch with Jantzen. While this is a fictional agency, certainly there is some historical based fact with Jantzen and advertising (J. Walter Thompson worked with Jantzen.) Many of the scenes at the first fictional agency in Mad Men, Sterling Cooper, have Jantzen images hanging on the walls and there is a wonderful swimsuit clad model in the opening credits. More recently, and based on fact, Plazm was hired when Perry Ellis acquired Jantzen in 2002 to re-brand the Jantzen mark. You can see more of that information here. It's it exciting to see how the Jantzen logo has developed over the years. I don't think any agency would have thrown Jantzen out on their heels as Don Draper did last night, but this is television. And I can't wait to see more! 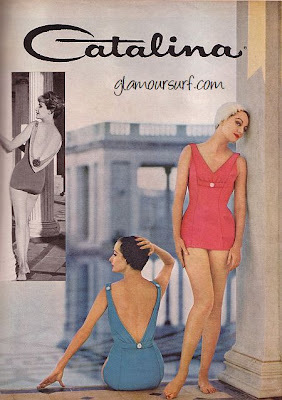 A fabulous video featuring many vintage swimwear styles from the 1920s to the 1980s. I wanna be there! And I love it when the kids are included! PS - the video kept buffering for me, but its worth the wait. Watumull's has been around since 1914, specializing in Hawaiian clothing. Watumull Jhamandas Mirchandani was a businessman selling imported goods from the orient in 1914. Born in India, he made his fortune in Hawaii as a merchant and real estate agent. In 1942, he published the Watumull Foundation to help increase India's national efficiency and promote cultural exchanges between India and the United States. He was one of the first Indians to arrive in Hawaii. His business center was initially in Manila. The Philippines had recently obtained independence from Spanish rule and the political scene in Manila was in turmoil. With the advent of the First World War, when the US military moved its operation from Philippines to Hawaii, Jhamandas – with his keen foresight for business – decided to move his operation to Honolulu as well. His brother, Govindaram joined him in establishing the “Watumull Brothers” company. Their children adopted “Watumull” as their family name. His legacy is carried forward today by his son Gulab and daughter-in-law Indru. Gulab arrived in Hawaii in 1949. Watumull's East India Store led the way by commissioning artist Elsie Das to create fifteen floral designs. Her hand-painted designs were sent to Japan where they were printed by hand onto raw silk. 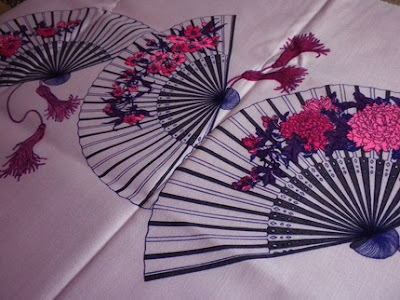 According to Elsie Das, a Japanese manufacturer once printed a set of her floral designs on heavy satin by mistake. 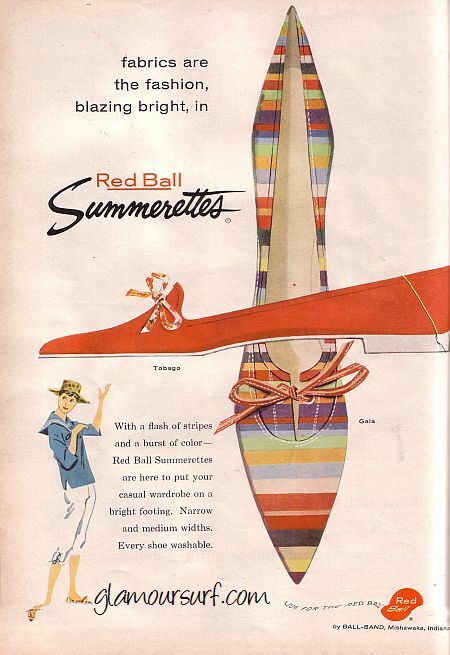 "These started a vogue in Hollywood. 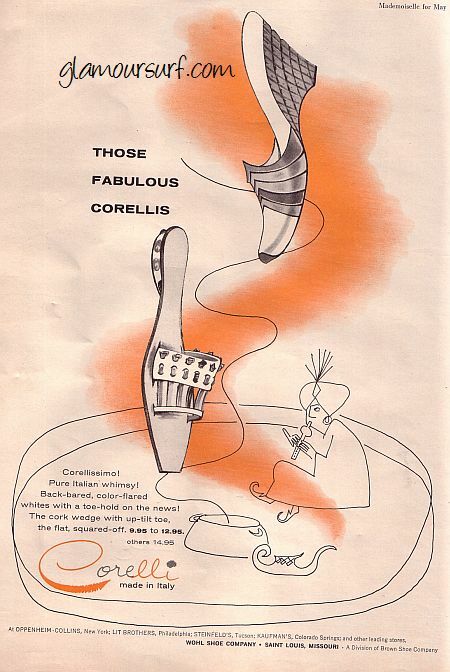 Ginger Rogers, Janet Gaynor and other stars bought bolts of the stuff and had it made into 'seductive gowns.' 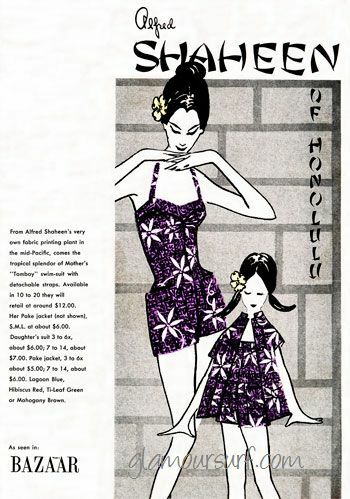 The result was an epidemic of Hawaiian designs, with hibiscus and ginger breaking out on table cloths, napkins and scarves all over the country." 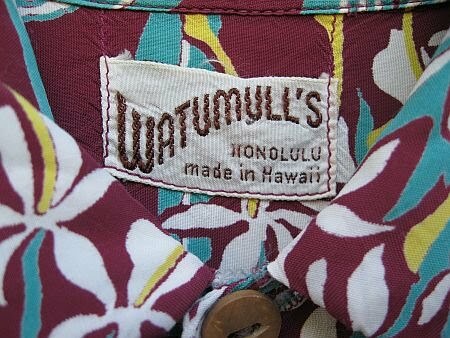 Vintage Watumull's Hawaiian clothing is getting harder and harder to come by. Most of the examples I found on line are in Japan. I did find a couple on line though that were in English. We were fortunate to find this one a little while ago. This piece dates to the 1940s and is made of Rayon. It has the classic coconut shell buttons with horizontal buttonholes, short sleeves and a single chest pocket. Check out that wind collar! First off, a GIANT thank you to Camille for sharing time with us to answer some of our many questions and to send along images to support this blog post. We appreciate the time and effort put forth to carry on your fathers legacy, the family history and to continue to collect, grow and protect the Shaheen brand. You are a true inspiration to many of us vintage afficianados out here, myself included and standing first in line. Shaheen's legacy has lived on and now his pieces are collectible. Do you feel he ever considered this as a young man? No. My father’s main goal was to support his family, provide a living for his employees, and create clothing that had meaning. Even in his 80s, after receiving Hawaii’s lifetime achievement award and being honored as one of the 150 most important influences in Hawaii’s history, he didn’t understand how much he had accomplished. When I tried to explain it to him, he said: Honey, I was just doing my job. My father started in 1948 on the site of the original Shaheen family home. His first print plant, Surf 'n Sand Handprints, was established in a Quonset hut on the outskirts of Honolulu in the early-1950s. 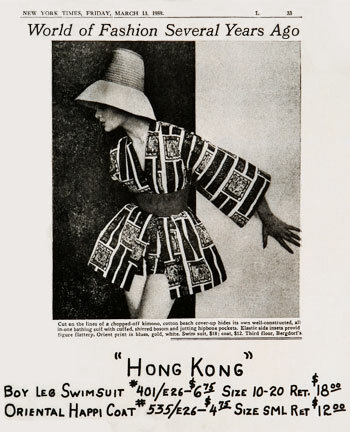 Within a decade, his clothing and fabrics were famous worldwide. He attributed this accomplishment to the fact that he printed his own fabrics. The image below was the new state-of-the-art factory Shaheen's occupied in 1957. Where did Shaheen draw his inspiration from? My father drew his inspiration from authentic cultural art, museums, and rare books. He visited foreign countries with his design staff. They would immerse themselves in the local culture and design new prints and a line of clothing based on their experiences. This is why Shaheen fabrics and clothing are filed with imagery drawn from many different cultures. This is also why you find labels with names such as "Hong Kong by Alfred Shaheen," which is the line of clothing he created based on their experiences in Hong Kong. How did Shaheen get the title "Master Printer"? My father produced five lines a year. In a matter of days after breaking a line, he would see copies of his prints being offered by other manufacturers for a less expensive price. He couldn't lower his prices to compete with the less-expensive copies because he had incurred the development costs. When my father discussed this problem with his staff, someone suggested it was important to tell customers that Shaheen clothing is more expensive because Shaheen is the original -- Shaheen is the Master Printer. My father felt comfortable with the phrase and the label Alfred Shaheen, the Master Printer, was established. 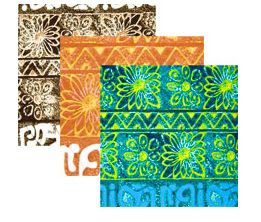 An example of one of these copied prints is the Tiare Tapa. Because Elvis Presley wore the Tiare Tapa in his movie poster for Blue Hawaii, the Tiare Tapa has been reproduced for decades by clothing manufacturers and those seeking to market Elvis. 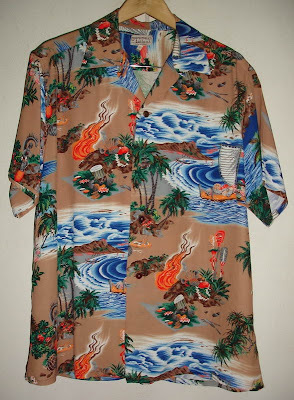 Some have even renamed the print "Blue Hawaii." 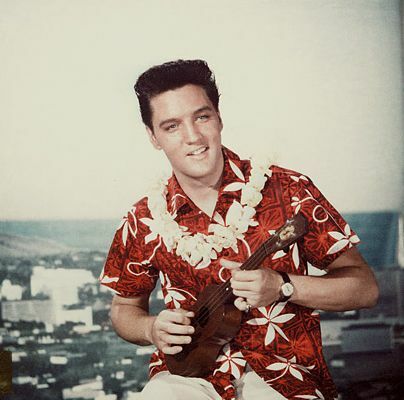 But, as my father stated, the Tiare Tapa was a famous Shaheen print long before Elvis wore it. Why did Shaheen decide to branch away from the traditional loose-fitting Hawaiian attire? 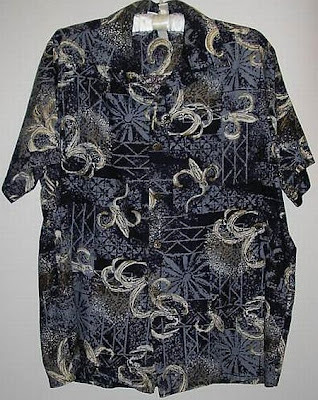 My father rarely made traditional loose-fitting Hawaiian mu'us. His focus was making women look beautiful and sophisticated. On the rare occasions that he made loose-fitting mu'us, he made them from fantastic fabrics with dramatic cuts. 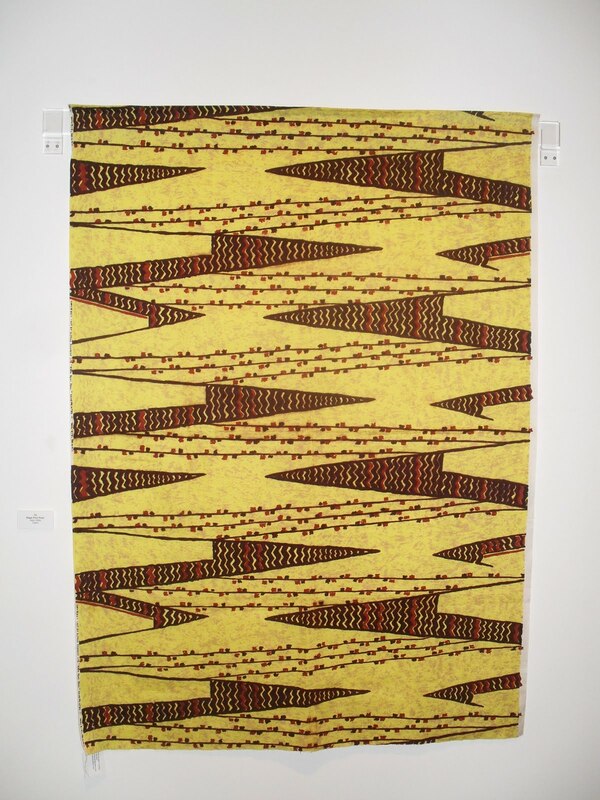 For example, one of the pieces shown in the SJMQT exhibit is a loose-fitting mu'u created from fabric that is heavily hand-screened with Indian paisleys in a rainbow of metallic colors. The yoke is fashioned from black velvet, which crosses the shoulders and dips deep into the back, ending with a black velvet bow. Did Shaheen ever produce children's clothing? Yes. From the 1950s through the mid-1960s, children's clothing was a big part of Shaheen production. 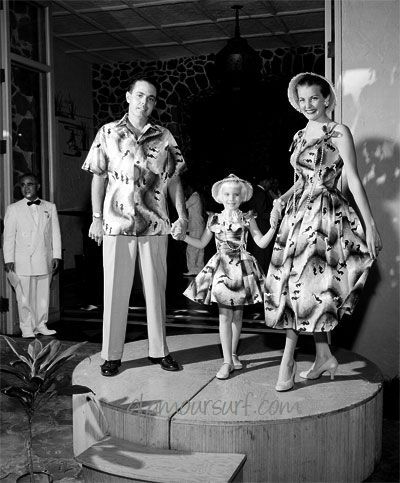 During the 1950s, families loved matching outfits. 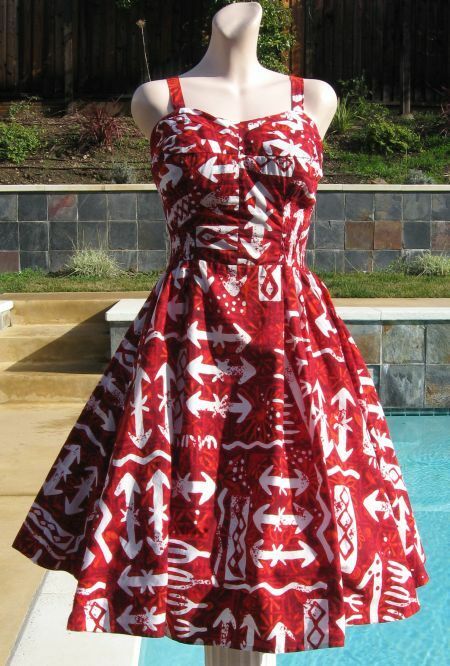 My favorite design is the Pua Lani Pareau. 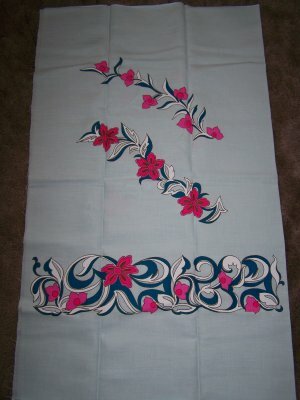 Like the Tiare Tapa, the Pua Lani Pareau has been reproduced indiscriminately by clothing manufacturers for decades. Although a contemporary Hawaiian shirt company has renamed the print and uses it as its signature print, the Pua Lani Pareau will always be an Alfred Shaheen original. 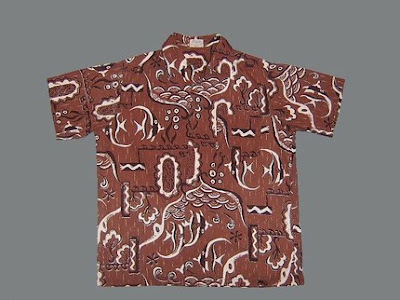 The Pua Lani Pareau is the most famous Hawaiian print in history -- it is synonymous with the Hawaiian mystique and a visual representation of Hawaii throughout the world. What steps are you taking to continue the brand? The Alfred Shaheen name and prints have been licensed for different products. This month, Suburban Home, a division of Duralee, is unveiling Surf ‘n Sand by Alfred Shaheen, a line of fabrics for indoor and outdoor furnishings. 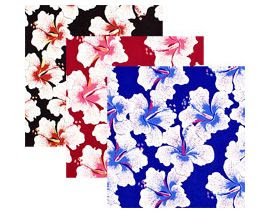 Also this month, FreeSpirit Fabric, a division of Westminster Fibers, is releasing 25 Hawaiian and Asian prints on fabrics for crafting, quilting, and home sewing. 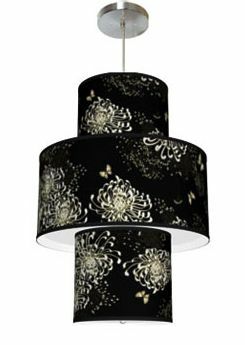 Seascape Lamps produces Shaheen lighting; and in 2011, we’re looking forward to rugs by Chanda Rugs and dinnerware by Precidio Design. In addition to licensing, we create unique prints for special clients. 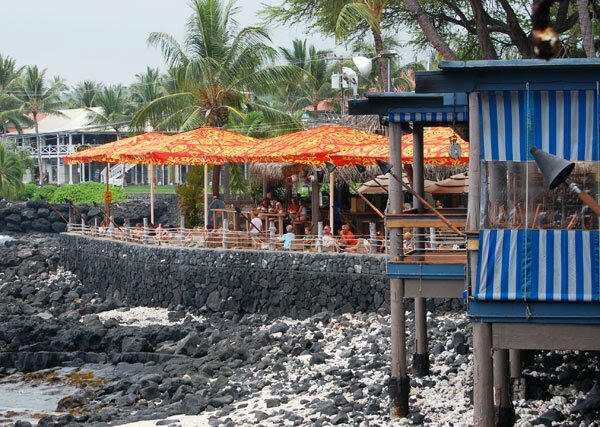 For example, for Huggo’s Restaurant on the Big Island, we designed a special Tiki Pareau print to cover 1,600 square feet of outdoor umbrellas. How large is your collection of your father's work? 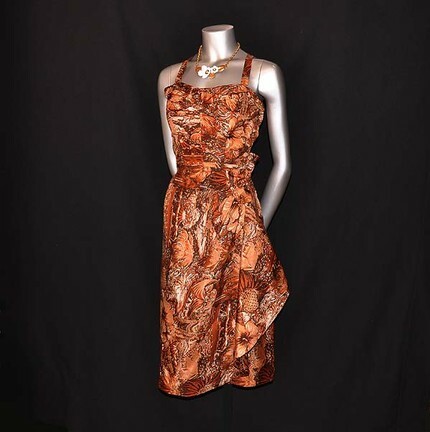 My collection is substantial because I collect men’s, women’s, and children’s clothing, and fabrics, patterns, original textile designs, vintage photographs and advertisements, shoes, hats, jewelry – even perfume! My father also created magnificent drapery fabrics, which I also collect, along with documents and business-related items from Shaheen's, which existed for 40 years. Are there plans for a Shaheen museum? I’d love to be involved in helping to establish a museum that would include not just Shaheen, but all of the Old Masters of the Hawaiian garment industry. It would be important that such a project also include the special and creative people who contributed so much, but who are rarely recognized. Examples of such people are the brilliant textile designers, Bob Sato and Tony Walker, and fashion designer, Richard Goodwin. Another example is the innovative Pat Dorian, who invented the reverse-print shirt. Dorian's invention set the stage for a revolution in Hawaii's fashion industry and business world. 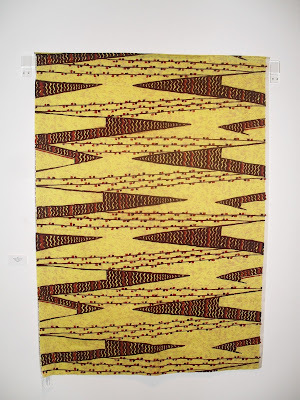 How did the current show at the San Jose Museum of Quilts and Textiles come about? My father's death in 2008 brought a new wave of appreciation for his accomplishments. Museums and historians contacted me to arrange for exhibits, advising me that my father's globalization of ethnic imagery on textiles and clothing spawned the multicultural aesthetic "fusion fashion," which is the combining of different cultural elements and traditions in western-styled clothing. 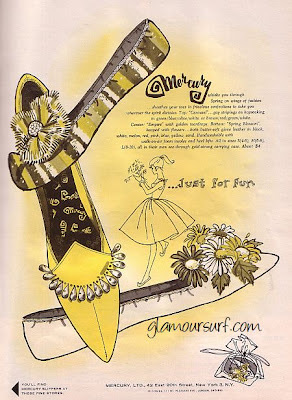 They advised that the fusion fashion design aesthetic he originated is now recognized worldwide as the visual marker for transnational Hawaiian culture and our modern-day informal, environmentally aware, multicultural West Coast "American" lifestyle. The show at the San Jose Museum of Quilts & Textiles will travel to Michigan, Washington, Hawaii, and Los Angeles. A separate museum exhibit focusing on my father's design aesthetic is scheduled to open next summer in Orange County, California. All images provided and copyrighted by Camille Shaheen-Tunberg and may not be used without permission. Interview with Camille Shahee-Tunberg is a coming! We were going to conclude our week of Shaheen posts this week with an interview with Camille Shaheen-Tunberg. We are going to receive her answers this weekend so I'll do a teaser post and let you read a bit of her Q & A with the San Jose Museum of Quilts and Textiles located here. You will be able to see our interview with Camille on Monday! Stay tuned, you don't want to miss this. Please check back, and thank you Camille! Tourists began flocking to Hawaii in the 1950s as faster airplanes allowed for easier travel and the former U.S. territory became a state in 1959. 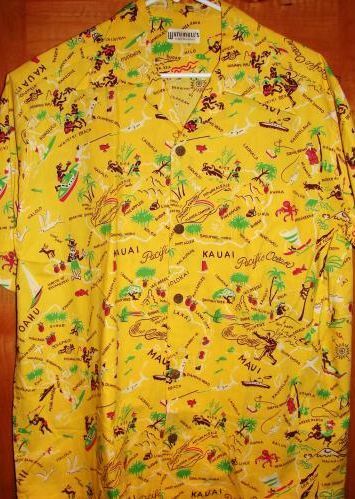 Tropical Aloha shirts and Hawaiian sundresses became souvenirs for tourists to the area. But it was Alfred Shaheen who raised the quality of the Aloha shirt to an art form. He hired his own artists, made his own prints, had his own factory and raised the bar on quality construction. 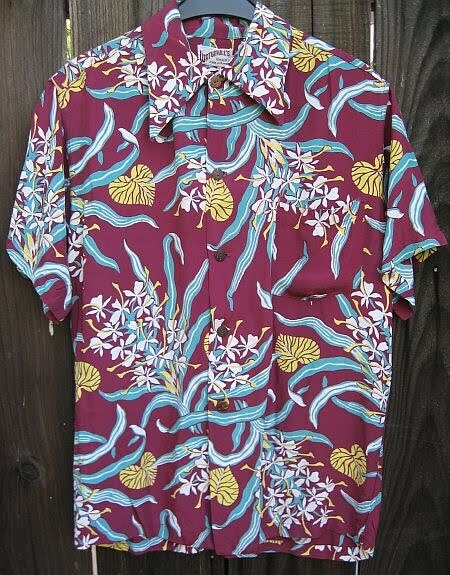 Shaheen initially began his business by producing 'Aloha Shirts' but they were different from his competitors in types of styles, and prints. Shaheen's original aloha shirts were crafted with material imported from the mainland US, but he realized this wasn't a viable business structure for the long term. 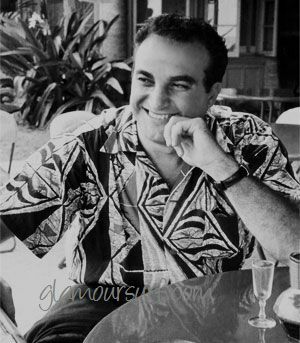 Shaheen soon after launched his own printing plant and created his own fabrics, called Surf 'n Sand Hand Prints. Prints were inspired by the native designs out of the South Pacific, Hawaii and Asia. Shaheen also began a tradition that remains prevalent in the design of Hawaiian Aloha shirts today: horizontal button holes. Not all of his shirts had horizontal button holes but most did, although there does not seem to be a rhyme or reason why Shaheen deviated from the standard practice of making vertical button holes. 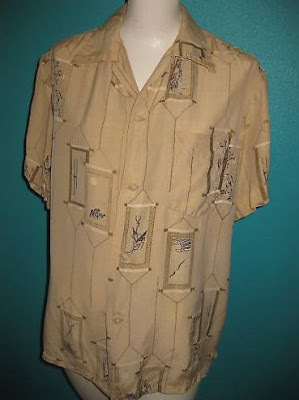 Vintage Shaheen shirts are very collectible these days and getting harder to find. Aloha. Today we look at some vintage Shaheen clothing we have or have had over the years. 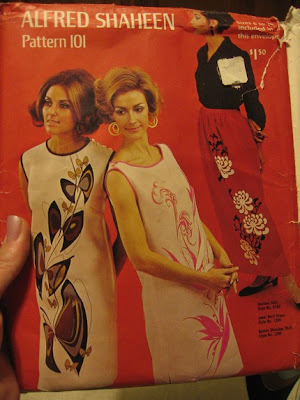 Plus a round of vintage Shaheen dresses that were or are currently available on line. This first piece I just found over the past couple of weeks. 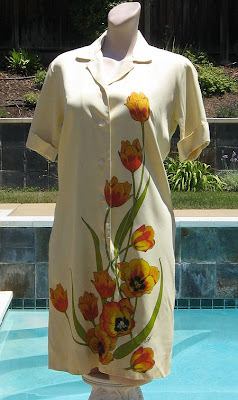 Its a wonderful heavy rayon twill vintage mid 60s dress, with a fabulous matched fabric panel front and back California Poppy print on a very soft yellow background fabric. 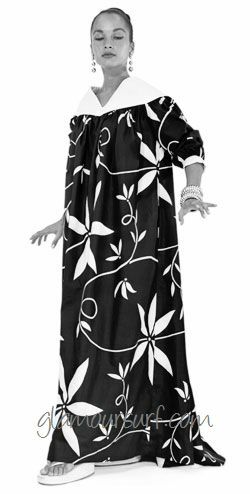 I've never seen a heavy rayon from Shaheen. 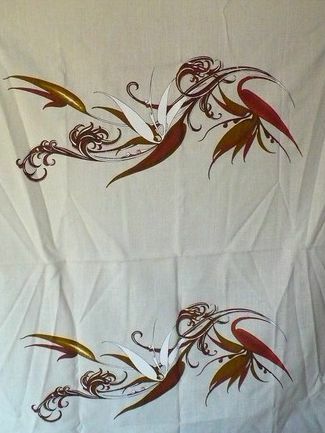 I've have held and seen lightweight rayon prints from him but this one is pretty exceptional. 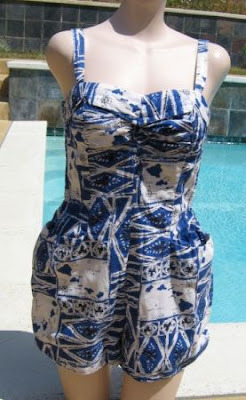 And then there is this Shaheen cotton swimsuit playsuit which we sold off of our Glamoursurf site quite a while ago. Isn't it fab? This maxi dress is still available from us here. Perfect as a resort wear ensemble. Another fabulous cotton Shaheen dress we have sold. And a rare example of Shaheen stepping out of his traditional Hawaiian boundaries. This one features greyhounds (I think) in a long maxi skirt. 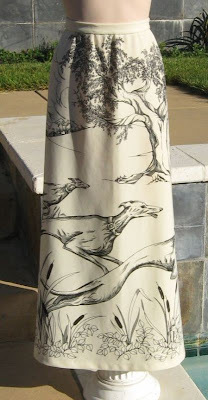 the design wraps around the skirt with the dogs and landscape. This one has also sold. 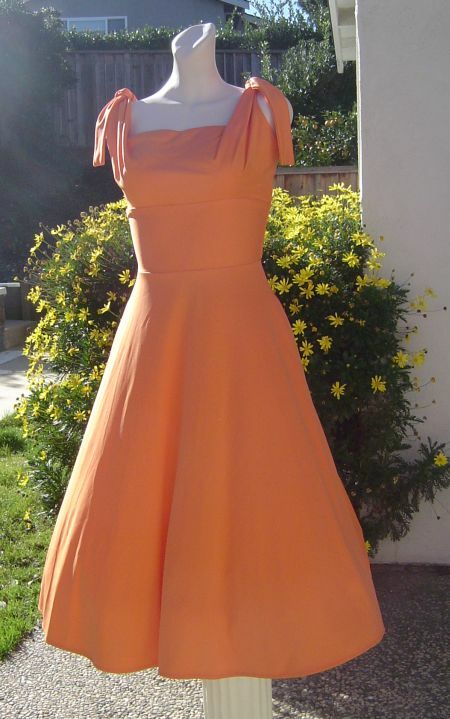 Then we has a scrumptious new old stock vintage 70s dress that had the most unusual inner bustline treatment. It held the bust in place by an inner maneuver I'd never experienced before. Also off to a new owner. And finally our piece de resistance. I loved this 1950s wiggle sarong dress. 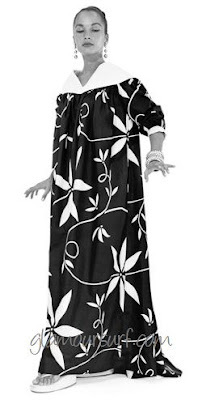 It was basically new old stock and had the fabric swag that draped over the shoulder and over the back of the dress. I was so pleased to see the fabric hanging at the recent Shaheen show. Also, gone to a new owner. 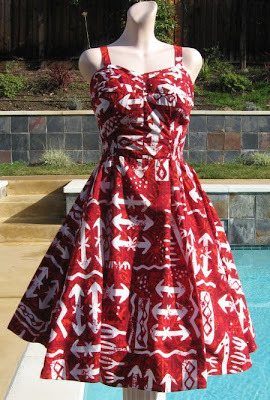 Kapa Poni Poni - Early 1950s Cotton Yardage - This fabric was designed by Shaheen after studying Hawaiian Kappa at the Bishop Museum. Meet Linn. 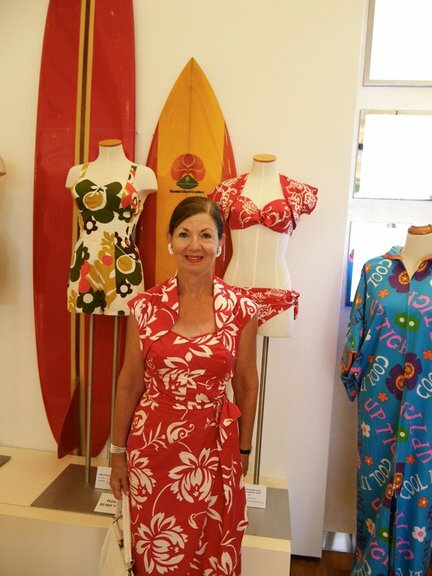 She is a fellow VFG member and visited the "Fifty Years of Fashion in Hawaii" exhibit wearing her Shaheen Sarong Dress with bolero. She is standing in front of a Kamehameha swimsuit with a very similar pattern. Linn sells vintage jewelry on Ruby Lane. You can find her shop here. 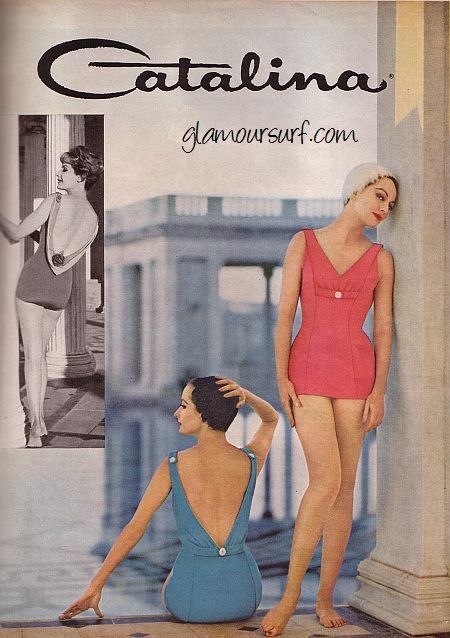 Another VFG member SecondLooks had this sweet swimsuit playsuit at one point. It's the same print as Linn's but in a different color. This pristine piece is available at a reasonable price from Wearitagain of ETSY. 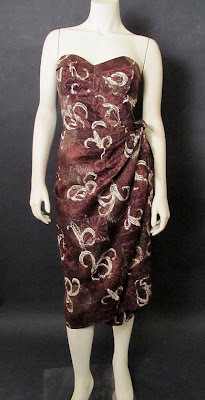 This silk bombshell beauty is available at Planetclairevintage on ETSY. This piece is available from DesertRoseVintage. As with all vintage you purchase, make sure all of the information you need is in the listing. If not, ask. Buying a piece of history to wear is classic and timeless. I can guarantee that most vintage clothing quality is far superior to any modern day bought at the mall piece. Happy shopping! Continuing with our GlamourSplash week of posts on Alfred Shaheen, today we focus on Shaheen fabrics. Recently, a new collection of indoor & outdoor Alfred Shaheen fabrics have been brought into production. In keeping with family tradition, Camille Shaheen-Tunberg has teamed up with distributors to launch a new line of Shaheen fabrics. Debuting in July at Suburban Home, The Surf And Sand Indoor/Outdoor Print Collection captures fanciful patterns that evoke memories of luaus, sultry breezes, and the sweet scent of plumeria leis and adds a fresh twist with new scales and colorways to fit today’s modern applications. 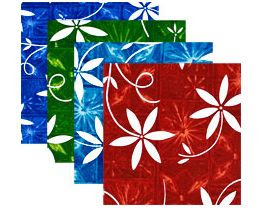 Suitable for the sofa in any Tiki Hut or hanging outdoors on the Lanai, Surf And Sand Indoor/Outdoor Prints are designed to add notes of paradise to any setting while maintaining the durability required to face the elements. For those of you in Portland, you can visit Landfair Furniture + Design Gallery showroom in Portland, Oregon to see some samples. For those of you who sew or quilt, Westminster Fibers and Free Spirit Fabric have teamed up with Shaheen to launch vintage hand prints for quilting and sewing. These will be available in mid to late July. Imagine sewing your own pillows, creating frames, adding a tropical touch to your decor with your own crafting imagination. 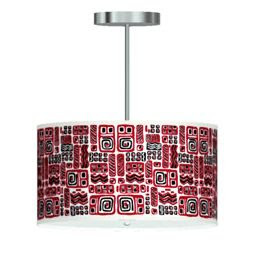 To pull it all together and complete your decor you might like an Alfred Shaheen lamp. 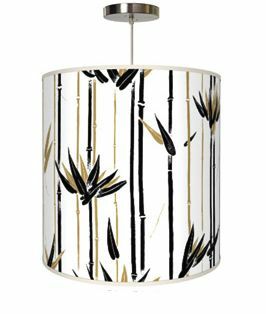 The folks over at Seascape Lamps offer a selection of pendant, table and floor lamps all with Alfred Shaheen designs and the prices are very reasonable. 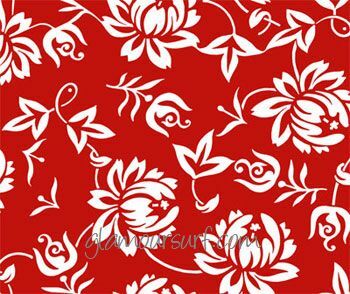 Pumpkintruck has this 45" wide x 56" long panel of pink fan fabric available. AusableRiverTrader has a 43" x 53" vintage piece marked on the selvage with wash care instructions stapled to the back. 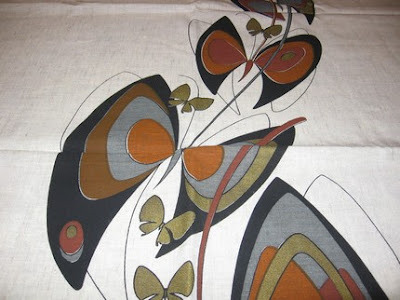 VintageTempest has a fabulous butterfly panel WITH a Shaheen sewing pattern to boot. Sewuniquetreasuresandgifts has two beautiful Shaheen border print panels. Whatever you decide to sew or decorate with these is up to your imagination. Hope you have fun creating your own tiki style!